Babies love cute teddy bears! This beautiful newborn girl gift features a soft, plush, brown teddy bear and a soft fleece baby cap that you can have embroidered with her name on it for an extra thoughtful touch. 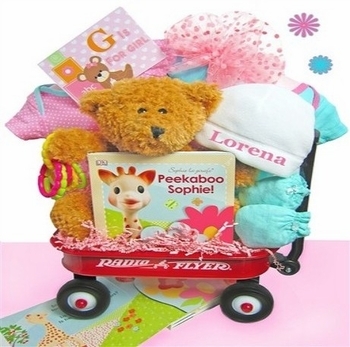 We also add two cotton baby outfits, an interactive bed time story book, scratch mittens, and a teether to complete this lovely mini wagon gift. Baby will surely appreciate the mini Radio Flyer wagon when she is big enough to start using it to pull toys around.